acquired cystic disease in patients with end-stage renal disease (ESRD) after several years of dialysis. Renal cysts are categorized as simple or complex. The Bosniak renal cyst classification system was created to help distinguish simple renal cysts from complex renal cysts. Simple renal cysts typically do not cause any signs of symptoms. Larger renal cysts may cause abdominal pain or fever if the cysts get infected. 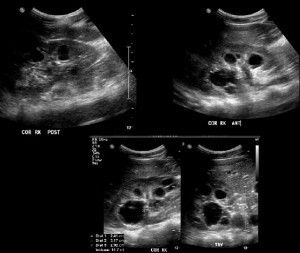 Simple renal cysts may be diagnosed incidentally on routine ultrasonography examination. If the ultrasonogram study is equivocal or there is presence of calcifications or septae in the renal cysts, a computed tomography scan should be considered to further assess the characteristics of the renal cyst. Some simple renal cysts have rarely been associated with rupture, haematuria, abdominal pain, abdominal swelling, infection and/or hypertension. ADPKD is a systemic disease that can be hereditary. It is characterised by multiple renal cysts in both kidneys. 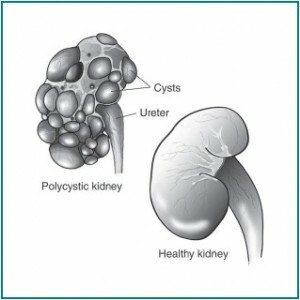 The cyst can rupture causing pain, haematuria and/or infection. Cysts haemorrhages are best managed conservatively and any evidence of infection should be treated with antibiotics. A significant proportion of adult ADPKD patients have hypertension. Tuberous sclerosis (TS) is characterised by multiple benign congenital tumours occurring in the brain, retina, skin, heart, kidneys, liver, lungs and/or bone. 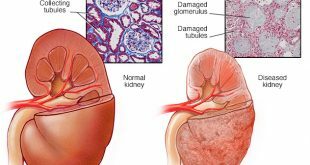 Patients with tuberous sclerosis may develop multiple and bilateral angiomyolipoma in the kidneys, with or without cysts. Von-Hippel-Lindau is a rare form of inheritable disease. Patients with Von-Hippel-Lindau disease may develop benign or malignant tumours such as hemangioblastomas (including retinal hemangioblastomas), clear cell renal cell carcinomas (RCCs), pheochromocytomas, endolymphatic sac tumors (ELSTs) of the middle ear, serous cystadenomas and neuroendocrine tumors of the pancreas, and papillary cystadenomas of the epididymis and broad ligament. In patients who have been on dialysis for three or more years without a limited life expectancy, initial screening with ultrasonography is suggested. A contrast-enhanced study may be required to assess further the characteristics of complex cysts. Matson MA, Cohen EP. Acquired cystic kidney disease: occurrence, prevalence and renal cancers. Medicine 1990; 69:217. Marple JT, MacDougall M, Chonko AM. Renal cancer complicating acquired cystic kidney disease. J. Am. Soc. Nephrol. 1994; 4:1951-1956.